"To disappear" was newly defined during the twentieth century military dictatorships in Latin America. "Disappear" evolved into a transitive verb describing those considered threats to the State who were kidnapped, tortured, and killed by their own military, especially in the 1970's in Argentina, Brazil, Chile, and Uruguay. The Disappeared brings together the work of 26 living artists from Latin America who, over the course of the last thirty years, have made art about los desaparecidos or the disappeared. These artists have lived through the horrors of the military dictatorships that rocked their countries in the mid-decades of the twentieth century. Some worked in the resistance; some had parents or siblings who were disappeared; others were forced into exile. The youngest were born into the aftermath of those dictatorships. And still others live in countries maimed by endless civil war. Disappearance was inevitably linked to torture. Artists in the exhibition are Marcelo Brodsky (Argentina), Luis Camnitzer (Uruguay), Arturo Dulcos (Chile), Juan Manuel Echavarra (Colombia), Antonio Frasconi (Uruguay), Nicolas Guagnini (Argentina), Sara Maneiro (Venezuela), Cildo Meireles (Brazil), Oscar Munoz (Colombia), Ivan Navarro (Chile), Luis Gonzles Palma (Guatemala), Ana Tiscornia (Uruguay), and Fernando Traverso (Argentina). A collaborative work by Argentinean artists Carlos Alonso, Nora Asln, Mireya Baglietto, Remo Bianchedi, Diana Dowek, Len Ferrari, Rosana Fuertes, Carlos Gorriarena, Adolfo Nigro, Luis Felipe No, Daniel Ontiveros, Juan Carlos Romero, and Marchia Schvartz is also in the exhibition. 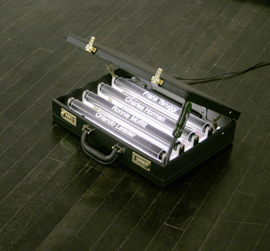 The Disappeared was organized by the North Dakota Museum of Art with funding from the Otto Bremer Foundation, the Andy Warhol Foundation and the Lannan Foundation and curated by Laurel Reuter, Director, North Dakota Museum of Art. A catalog by the same title was written and edited by Laurel Reuter with a preface by Lawrence Weschler and pubic by Charta and the North Dakota Museum of Art. Funded in part by an anonymous sponsor, FMC Corporation, AT&T, Murdock Law Offices P.C., and the National Advisory Board of the UW Art Museum and the Wyoming Arts Council through the National Endowment for the Arts and the Wyoming State Legislature. 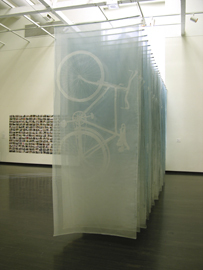 Left: Fernando Traverso (Argentina), In Memory, 2000-2001, 29 silk banners, each 10 x 3.5 ft with screened images of bicycles. 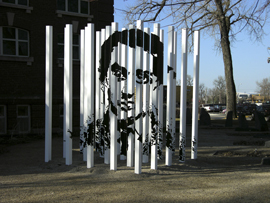 Courtesy of the North Dakota Museum of Art.